Print the coupons below and bring them to your next appointment! 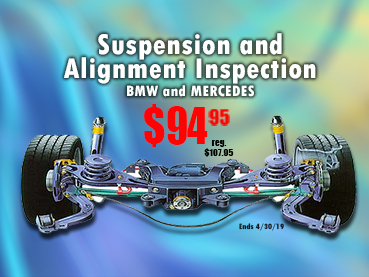 For April 2019, come in for a Suspension and Alignment Inspection and save! Only $94.95 reg. $107.95. Offer ends 4.30.19. Make an appointment today! Only for BMW and Mercedes Benz. Just mention this page or print it out and bring it with you.